I really love to give gifts. It’s true. 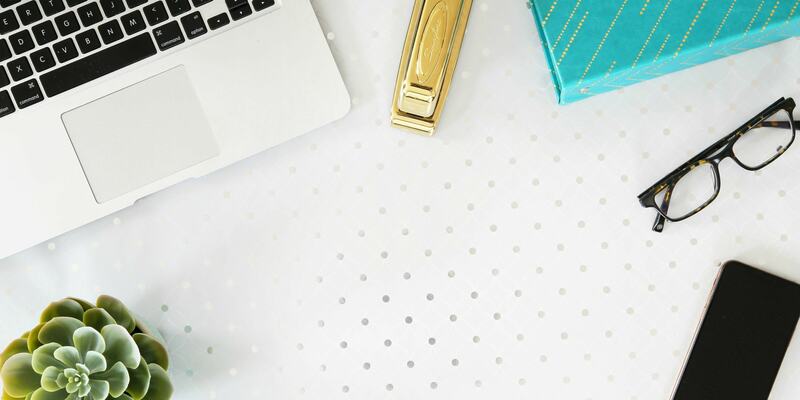 Sure, it can sometimes be stressful to try to think up a great gift idea, but for me, it’s also a fun challenge to try to figure out exactly what the recipient might need or want and find the perfect gift to meet that need. I especially have a love for personalized gifts. Maybe it’s because when I was little I couldn’t ever find my name on anything (though I can now!) or maybe it’s just because I feel like when someone’s name is on something it gives it an extra special touch, like the gift was made especially for them. Whatever the reason, if I can monogram it or write your name across it, you’d better believe that I’m going to do it! So of course Christmas gives me the perfect excuse to put my personalized gift giving into action. 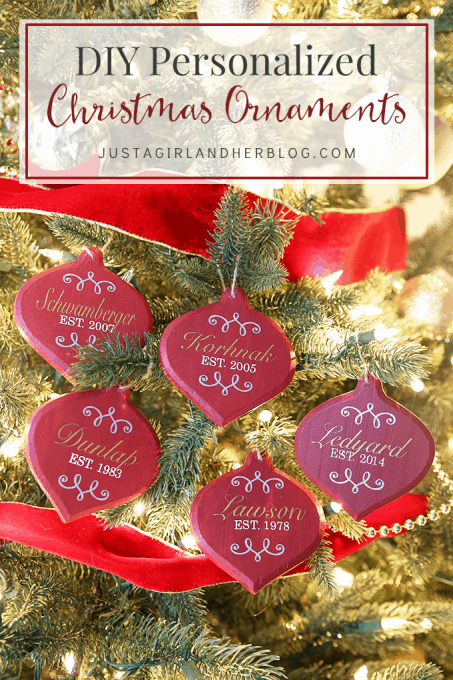 I think it’s kind of fun to have a small token for each family to take home from our Christmas celebration as a memento, so last year I made some easy monogrammed ornaments for everyone. 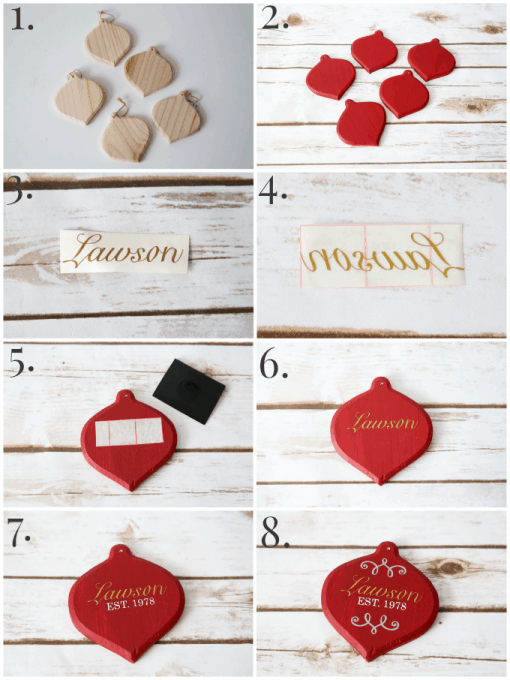 This year I wanted to do something a little different while still continuing the personalized ornament tradition, so after much brainstorming and scouring the craft store for inspiration, I finally came up with these little gems. 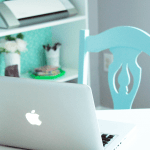 Adhesive Vinyl– I used gold, silver, and white. Now I “cheated” a little bit and had my Silhouette cut out my letters for me. 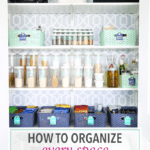 If you don’t have a cutting machine, you could use the chalk transfer method I used in this post to create your letters and paint pens to fill them in. I started with my wooden ornament blanks and sanded down any rough edges (1). I then removed the tie so that I wouldn’t get any paint on it, and I painted my blanks red (2). As they were drying, I created my design in the Silhouette Studio software. I used a font called Snell Roundhand for the script and Playfair Display for the print. I also used the curlicue shape from this design in the Silhouette Store. Once I had my design set, I had my machine cut it out, and I used the hook tool to weed away the excess vinyl (3). Tip: Sometimes working with small letters like these can be a little tricky. I found that for some reason when I began to peel off the excess vinyl from the end of the word, it seemed to pull away more easily than when I started at the beginning. I then cut a small piece of transfer paper, removed the backing, and pressed it down onto my word. I was then able to remove the backing from the adhesive vinyl (4). Centering my design on the ornament, I used my scraper tool to press it into place (5). I peeled back the transfer paper, and I had my first word done (6)! I repeated the process to add the year (7) and the curlicues (8). Finally, I used a paperclip to help me get my twine back through the little hole in the ornament so that I could hang them, and they were finished! 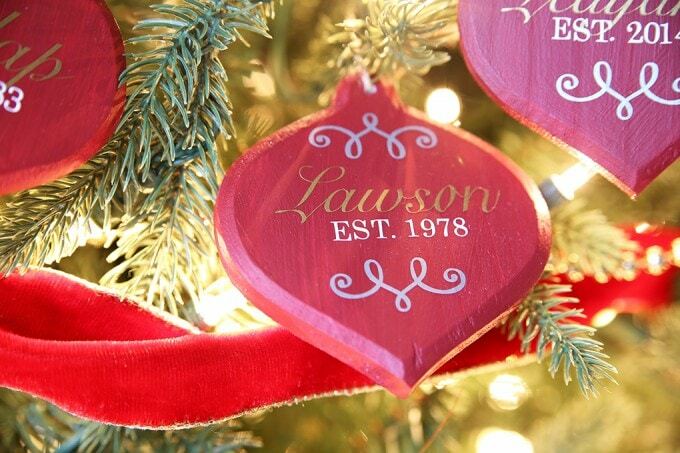 Now I think I need a few of these for my own tree… 😉 I just love that a $1 wood blank can turn into a personalized memento in just a few little steps! It such a simple little gift, but it can be hung on the tree and remembered for years to come. 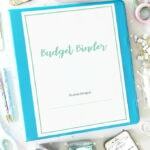 As the season of gift giving approaches, it is so easy to get caught up in the whirlwind of it all and forget that the very best gifts come from our hearts rather than from our wallets. True, I have always loved giving gifts, but I started looking at the process of gift giving in a whole new light after I read one little book. 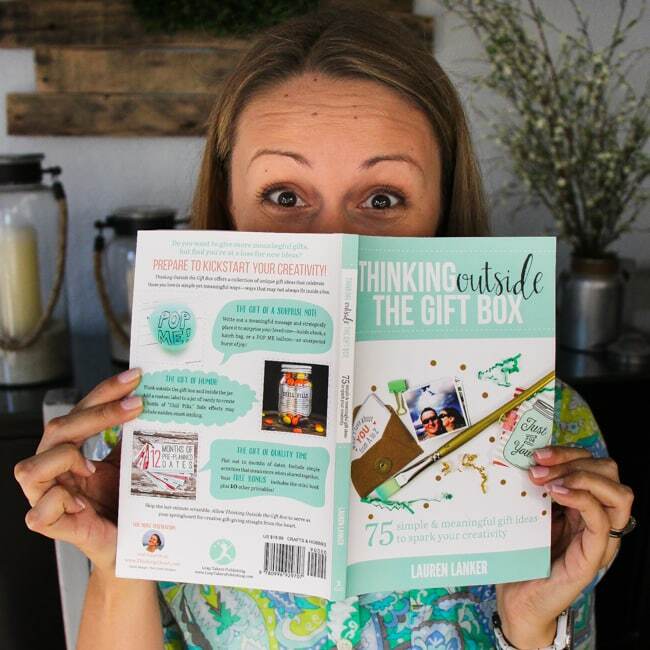 Last year around this time, my dear friend Lauren of The Thinking Closet self published an ebook called Thinking Outside the Gift Box. 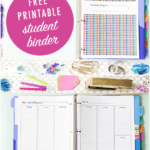 I read the book expecting to find some super fun gift ideas and tutorials– and I did! The book is chock full of them! But I also found so much more than that. I came away with a whole new outlook on gift giving. 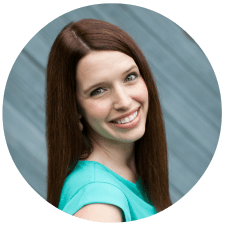 Through the stories Lauren weaves throughout the list of gift ideas and tutorials, I found inspiration, encouragement, and a renewed excitement about gift giving. It’s not about how much we spend or even how pretty our DIY gifts turn out. It’s about a way of making others feel truly appreciated through a simple, thoughtful gift. And that feeling is something they can remember for years to come. 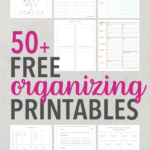 Along with the amazing gift ideas, Lauren includes pretty printables to help you execute them– it’s all there for you, just waiting to be gifted! 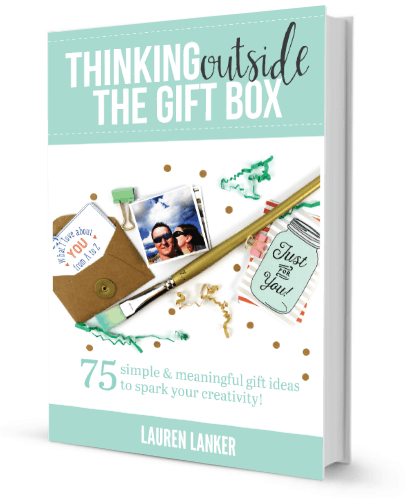 AND– if you like to physically hold a book in your hands like I do– Thinking Outside the Gift Box recently became available in paperback!! 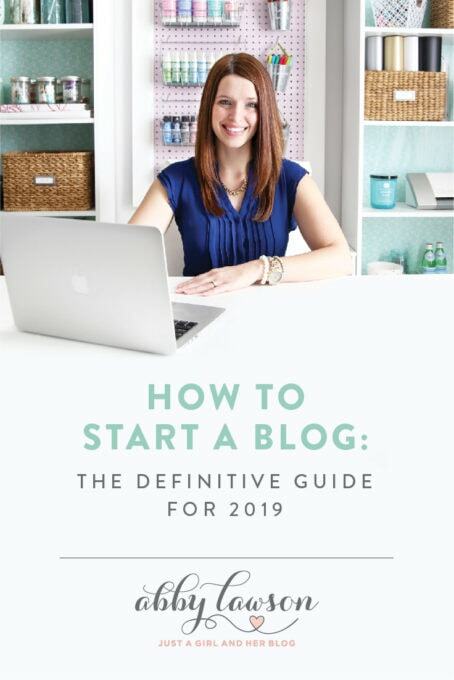 This is the perfect book to be able to grab your copy and a cup of your favorite beverage, curl up on the couch, and spend an afternoon being inspired. Lauren has an extraordinary talent for gift giving and for storytelling, and the way she combines the two in this book is absolutely incredible. 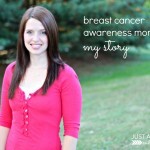 To learn more, head over to Lauren’s blog. These are so cute, Abby! My sister and I used to often make ornaments for our relatives when we were younger, but these are so cool-I might have to renew the tradition! I love these ornaments! They’re so cute and personal, and they’re the perfect gift to give to give to people who are hard to buy for! Our family used to have an ornament-making day every year before Christmas where we’d make a slew of handmade ornaments to give away as gifts (and of course a few to adorn our tree). Now, I’m inspired to put a date on the calendar for me and my Silhouette to make it happen this year! Thanks for this killer tutorial. And thanks for the incredible shout-out to my book, Abby! You are zee best. So glad to hear it has inspired you! What a FUN tradition! I love that! Thank YOU so much for inspiring us all to meaningful gift giving! You are the best, my friend! Hope you’re having a wonderful weekend! 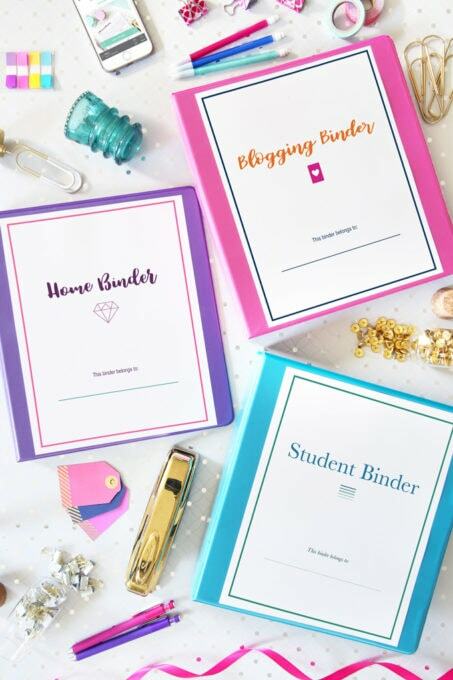 These are perfect personal gifts to give, especially to family members. They look so elegant but so simple at the same time. I love these!! 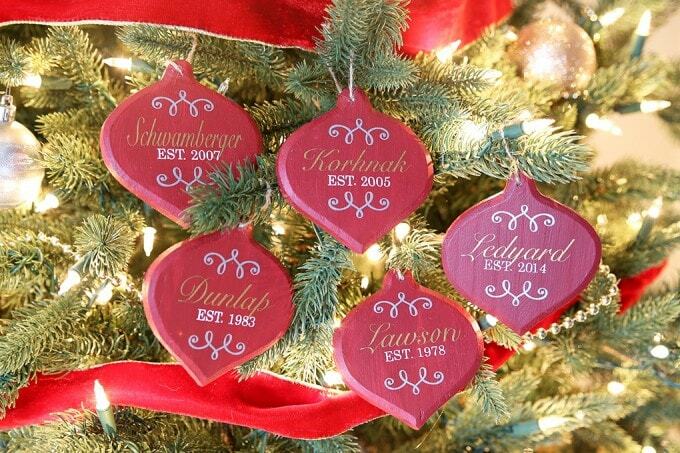 Me and one of my good friends do an ornament exchange every year and I am so going to make one this year! 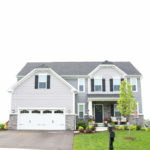 I like it, but this is too dificult to me.